Should You Consider Self-Funding Your Health Plan? In an age when healthcare benefit plans have a direct correlation with employee morale and the ability to attract and retain talent, getting the most out of your healthcare plan makes sense. According to 2009 report by the U.S. Department of Health and Human Services, about 26% of employers with between 100 and 499 employees self-insure, compared with more than 82% of employers with 500+ employees. Now, more than ever, having a self-insured (also referred to as self-funded) healthcare benefit plan makes both financial and sustainable sense. This holds true not just for enterprise level companies, but for mid-size entities as well who can and should avail themselves of the same benefits. 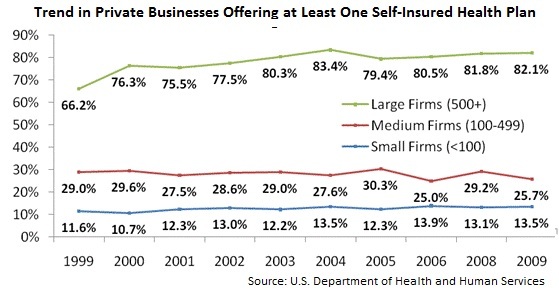 In evaluating the tradeoffs between fully insured and self-funded, companies see the two clear advantages that self-funding can provide — lower cost and freedom of plan design. Insurance companies charge a premium for assuming the risk of a healthcare plan. A profit margin is baked into their fees to reflect this risk – that a customer’s overall healthcare bills will be larger than anticipated, that there may be a catastrophic medical event or events. In good years, the insurance company makes money on your bundled plan. In years when you have higher than expected claims, you are virtually guaranteed that your premiums will go up the following year by more than just the projected claims trend. When your company is self-insured, this risk premium is eliminated and your company accrues the savings. In addition, if claims come in under what was anticipated, then your company automatically reaps the savings from lower claim expenditures. In a bad year, although your claims costs go up, the following year budget will generally increase by a lower amount than the premium increase under a fully-insured plan because the insurance company will always add on a profit margin in excess of the expected claims growth. The basic premise of self-funding is to take a longer-term view of three to five years and reduce the cost of your healthcare benefits plan over this time horizon. Generally, a company will have a bad claims year once every three to five years. The idea is to make sure that in the good years, you did not over insure and significantly reduce your savings. In this manner, if your claims experience is good, you will reap the majority of the savings so that in the bad year, the savings realized over the good years more than offsets the bad year. Another major advantage of self-funding is the freedom of plan design. Health plan benefits are not like buying the sports package on a new car. When you bundle everything together – high performance tires, sunroof, heated seats – you save money versus buying each a la carte. Instead, what happens when you bundle healthcare – medical, Rx, dental, vision, etc. – you get some at a low cost, some in mid-range, and others at a considerably high cost. And because they are bundled, you don’t know what you are paying for each versus the open market. When you unbundle, you can choose the best vendors with the best services and the best rates. While the majority of employers with 500+ employees choose the self-funded route, small to mid-size companies are often concerned about managing cash flow and the administrative workload. Using data and analytics, however, you can fine-tune your plans to get the exact services you need without overpaying. In addition, a robust healthcare benefits plan administration platform can make sure you have this essential data at your fingertips. Together, these strategies will help companies of all sizes get the most out of their plan for the least cost without reducing benefits.